Here's a picture of the people from our J-24 section at our favorite place, the Mongolian Bar-B-Q down along the river someplace. I believe this is my farewell party. On the left in front is my buddy "Zip" Zimmerman, now retired PHC and living in England. On the right is the Army major who was also in the change-of-command photo. The AF Lt Colonel (McNulty?) standing was also in the change-of-command photo. Behind him is our PHC Dumas with his girl friend (the same girl that was with him in the earthquake photo). As for the rest of the folks, I can remember their faces but not their names. There is one guy that I would know even with his back turned toward the camera and that is LI1 Donald Moak, our lithographer. 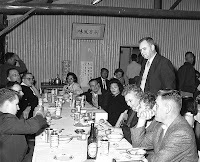 He is in the background on the right talking to people at a table. That is Moak's wife at the far end in the center at the head of the table.